Once you're aware of obnoxious lighting, you'll "know it when you see it," says City of Tumwater, Washington senior planner David Ginther. David Ginther: "To boil it down to one sentence: Keep it on your property. Don't send your light onto your neighbor's property. They may or may not want it. Sometimes they don't. And don't send your light up. Overall as everyone's light goes up, less and less of the sky is visible at night." Ginther guides me on a quick auto tour around town. In the process, he shows why his city council voted to require new outdoor lights be shielded and pointed downward. One reason is to reduce glare. Another, energy savings. Ginther points to a parking lot lit by a flood light aimed sideways. David Ginther: "More than half of the light from that light just is going up in the air instead of on the ground, which is an unnecessary cost for that business owner." Ginther says other motives to act include disruption to nocturnal animals and poor health for humans when they can't get a good night's sleep. He has me stop on a block where every home has unshielded porch and garage lights. Existing fixtures like these are grandfathered. David Ginther: "The houses are very close together here, some of them about 8-10 feet apart. Light from one house often is going right in the windows of another house." One by one, cities and counties around the Northwest are considering what has come to be known as a "Dark Sky ordinance." Sisters, Oregon; Goldendale, Washington; and Sun Valley, Idaho were in the vanguard. Tumwater joined a more recent wave along with Port Orford, Oregon and Bainbridge Island, Washington. 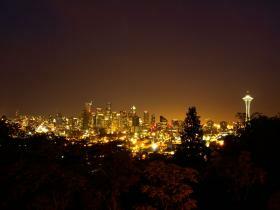 Author Paul Bogard claims homeowners and cities can "readily" dial back to fight light pollution. Bogard just wrapped up a Northwest tour with his new book "The End of Night." Paul Bogard: "Nobody is saying we should just go back to darkness. What people are saying is let's use the miracle of artificial light responsibly, thoughtfully, in a good neighbor way. We can use a lot less light than we're using right now for issues of safety, security and street lighting too." But this movement came to a temporary halt earlier this year when voters in coastal Bandon, Oregon repealed their city's brand new outdoor lighting ordinance. Referendum organizer Rob Taylor argued the regulation was "a huge government overreach." Rob Taylor: "We were trying to tell people that this is a matter of safety and security. Or even if it didn't give you more security, but it gave you the perception of security, we believe that was the right of the individual to choose for their own property." Taylor described his preferred path forward in a post-election letter-to-the-editor. "People who want 'Dark Sky' compliance can use public cooperation, personal communication and more education to achieve their desires. Only now, they cannot use the force of government to make other people comply with those rules, so everyone should be happy," he wrote. Statewide measures to regulate against light pollution have repeatedly failed in the Washington and Idaho legislatures too. Currently, city councilors and planning commission members in Cannon Beach, Oregon are debating whether or not a "dark sky" ordinance is needed in their town. A similar law just took effect in nearby Seaside. Author Bogard observes that enforcement is "hit or miss" when towns pass a dark sky law. The writer says before he can sound a "call to action," there has to be more basic awareness of light pollution. On that score, the Northwest chapter of the International Dark-Sky Association agrees there's still work to do. This is chapter leader Dave Ingram. Dave Ingram: "We're like the frog or the lobster in the pot. We become jaded to it and we put up with it and we don't object." Ingram says he's on a personal quest to get one place in each Northwest state designated as an International Dark Sky Park. Goldendale Observatory State Park in south central Washington is the first to qualify. Craters of the Moon National Monument in Idaho could be the next. Copyright 2014 KLCC-FM. To see more, visit http://www.klcc.org.